Mike Pearson - the CEO of Valeant Pharmaceuticals - released a letter in response to recent stock price falls. You can find the letter in an SEC filed 8-K. The letter was released before yesterdays 16.5 percent fall. In the letter they state that [Valeant] "expect the Salix business to represent approximately 20% of our 2016 revenue and expect double-digit script growth and corresponding revenue growth trends to continue". This surprised me. Valeant sales are over $10 billion per annum. They were 2.695 billion in the last quarter (including sales from Salix). If organic sales growth is 20 percent and the sales grow double-digit then Salix sales should be at least $2.2 billion during 2016. During the last year Salix was a public company (2014) Salix revenues were $1.13 billion. I guess they can square this circle with massive price increases for Salix products. However in the same letter Mike Pearson denies that Valeant's growth is dependent on price increases for pharmaceuticals. Mr Mike Pearson, I do not believe you. What would make Mr Pearson more plausible? There are numerous instances where I have found myself disbelieving Valeant's numbers and PR spin. If you want a really good analysis read AZ Value's wonderful blog. However I keep coming down to people and their personal credibility. You catch way too many strange, even implausible numbers at Valeant. And there are reasons to distrust the people more generally. It would be better if the Chair of the Audit and Risk Committee of the board did not have close association with past securities frauds. Let me introduce you to Norma Provencio. Ms Provencio is founder of Provencio Advisory Services, a healthcare consultancy. Ms Provencio has been involved with Valeant for some time. She was on the board of legacy Valeant and signed the original offer letter to Mike Pearson in 2008. "On May 15, 2003, we completed the first tranche of a private placement pursuant to which we sold 82,667 units to Mr. Mitchell Stein, SJ Investments and Ms. Norma Provencio at $3 per unit for cash amounting to $248,000. Each unit consisted of one common share and one warrant. Each warrant is exercisable at $3 until May 14, 2004. Upon exercise of the warrants each investor will receive one common share and an additional warrant to purchase one common share $6 per share until November 15, 2004." Ms Provencio was a director of Signalife (aka Heart Tronics), which is not mentioned in her official Valeant biography. This is a worrisome omission. Mitchell Stein, the controlling shareholder and Provencio's co-investor got into a bit of trouble and is now serving a lengthy prison sentence. Ms Provencio wasn't charged, but she was involved since the early days of the company, coming in alongside its principal mastermind and serving as a Director, Audit Chair, and consultant. This seems like a meaningful omission from her biography and raises questions about her suitability as audit chair for a company as complex and acquisitive as Valeant. Ms Provencio was also in the board of International Aluminum Corp, which went bankrupt at some point back in the mid-2000s (and is not mentioned either). There is discussion in the news about Valeant possibly receiving subpoenas concerning drug price hikes. If the congressional staffers concerned want more material on Valeant which helps them target their subpoenas then I can offer some low-level assistance. For my non-Australian readers (ie most of them) forgive a little and personal detour into Australian politics. Joe Hockey was Tony Abbott's Treasurer (finance minister in most countries). He is widely thought of as being one of the weak links in the Abbott Government and has lost his job in the new administration. He is leaving Parliament. Joe was not someone I agreed with much. My politics are a fair bit to the left of his. But I have a much higher opinion of him than most people and that opinion was from experience. Early in my career I worked in Tax Policy Division of the Australian Treasury. Much of my work was detail and accounting obsessive studies on what was really going on in tax avoidance schemes and the like. High bandwidth dry stuff. Most the details parts of tax policy and corporate law is handled by the Assistant Treasurer who used to go by the awful monicker of "Minister for Revenue and Assistant Treasurer". The wags always shortened this to the MiniRAT. When I was at the Treasury we had several MiniRATs some of whom were unimpressive. However I had a bit to do with Joe Hockey when he was MiniRAT and found that he was enormously quick at getting across the brief. He did not always agree with the Treasury advice - but he was able to enunciate the issues. He asked exactly the right questions - and sometimes questions we had not thought through ourselves. Joe had the bandwidth. I mean really properly. Joe was sharp. When he became Treasurer I had very high expectations. And I was mostly disappointed. As Treasurer he never looked the part. I do not know why. Partly I think it is hard to be a rational finance minister when you have an ideologically driven (rather than pragmatic) Prime Minister. Tony Abbott did not care for the numbers and that makes it hard to win on the numbers. Some people think he was just lazy. Smart but lazy. I see no evidence. Maybe he did not have the support necessary to carry things in Cabinet. I am an outsider these days. I do not know. I was disgusted at the way Martin Parkinson was railroaded out of the Treasury Secretary job (permanent head job in the UK context). That lowered my opinion of Joe - but again I was not privy to the politics. That said Joe, if you are reading this. Good luck in the future. Also here is some unsolicited advice to anyone who winds up in his future. Be aware that underneath the political bluster is a fine mind. I hoped for and expected a better end to Joe's career. But then maybe this is not the end of his career. This letter responds to your request, dated and received in this office on September 8, 2015, for any documents responsive to the claims that the SEC has investigated market manipulation in Herbalife stock by or on behalf of Pershing Square – the hedge fund run by Bill Ackman. We are withholding records that may be responsive to your request under 5 U.S.C. § 552(b)(7)(A), 17 CFR § 200.80(b)(7)(i). This exemption protects from disclosure records compiled for law enforcement purposes, the release of which could reasonably be expected to interfere with enforcement activities. Since Exemption 7(A) protects the records from disclosure, we have not determined if other exemptions apply. Therefore, we reserve the right to assert other exemptions when Exemption 7(A) no longer applies. It is the general policy of the Commission to conduct its investigations on a non-public basis. Thus, subject to the provisions of FOIA, the Commission does not disclose the existence or non-existence of an investigation or information gathered unless made a matter of public record in proceedings brought before the Commission or in the courts. Accordingly, the assertion of this exemption should not be construed as an indication by the Commission or its staff that any violations of law have occurred with respect to any person, entity, or security. Because the underlying circumstances may change, we may later disclose some of the exempt records. If you wish, you may request them again six months from the date of this letter. I am the deciding official with regard to this adverse determination. You have the right to appeal my decision within 90 calendar days from the date of this letter to our General Counsel under 5 U.S.C. § 552(a)(6), 17 CFR § 200.80(d)(5) and (6). Your appeal must be in writing, clearly marked "Freedom of Information Act Appeal," and should identify the requested records. The appeal may include facts and authorities you consider appropriate. You may file your appeal by completing the online Appeal form located at https://www.sec.gov/forms/request_appeal, or mail your appeal to the Office of FOIA Services of the Securities and Exchange Commission located at Station Place, 100 F Street NE, Mail Stop 2465, Washington, D.C. 20549, or deliver it to Room 1120 at that address. Also, send a copy to the SEC Office of the General Counsel, Mail Stop 9612, or deliver it to Room 1120 at the Station Place address. If you have any questions, please contact Warren Jackson of my staff at jacksonw@sec.gov or (202) 551-8312. You may also contact me at foiapa@sec.gov or (202) 551-7900. This is not surprising. I don't have an entirely satisfactory answer either. The question was about Alibaba - the Chinese internet giant - and the only reason I am going public is that Barrons has asked several of the same questions and Alibaba has responded. iii). Singles Day is a sort of anti-Valentines Day. On Valentines Day if you are attached you go out with your beloved. On Singles Day you go out and try to find a beloved. However more importantly it was the big day of online sales - think of it as Black Friday in America or Boxing Day in Australia. It is the biggest shopping day of the year. I also indicated that the questions would be along the lines of "how interesting is this" and "how much bigger can it get". The rule of thumb of course is that if an internet company can grow 500% from here you probably should own the stock. However if it is near the end of its growth period you should not own the stock - because it will derate. Lots of people started by arguing from China's growth rate - and they got projections 5x, 10x bigger than now. But a few noted that 278 million deliveries on Singles Day was "a lot" and thought that maybe it could double from here but ten times was not likely. But at this point I wanted to explore the 278 million deliveries number. So the question is "how many internet users in China". Most people guessed a number that was reasonable - so I pointed them to official numbers. Roughly 650 million would be a good guess. The official number at the end of 2013 was 618 million - and the growth rate has already slowed. The number of employees presented in this table does not include third-party consultants and contractors that we employ, substantially all of whom are based in China. These consultants and contractors primarily performed work related to sales, research, logistical support and customer service. Our total number of employees increased to 34,985 as of March 31, 2015 from 22,072 as of March 31, 2014. Of the increase in employees, approximately 7,300 was due to the completion of our acquisitions including UCWeb, OneTouch, Alibaba Pictures and AutoNavi, and a majority are engaged in engineering and data analysis. At the accounting date the total number of employees was under 35 thousand. Amazon - which has much smaller peak loads and far more obvious investment in high efficiency warehouses has more than 150 thousand employees. However Footnote 1 on the above table notes that this does not include "third-party consultants and contractors that we employ, substantially all of whom are based in China. These consultants and contractors primarily performed work related to sales, research, logistical support and customer service." We believe that orders from transactions generated on our marketplaces represented a significant portion of our delivery partners' total delivery volumes in the twelve months ended March 31, 2015. According to data provided by them as of March 31, 2015, our top 14 strategic delivery partners employed over 1,400,000 delivery personnel in more than 600 cities and 31 provinces, directly controlled municipalities and autonomous regions in China. Collectively they operated more than 100,000 delivery stations. This network managed the delivery of over 8.6 billion packages from our China retail marketplaces to consumers in the twelve months ended March 31, 2015. It may be possible that Alibaba has outsourced logistics almost entirely - with a million outsourced employees controlled by 35 thousand in-house employees. The numbers in the annual report are consistent with this. This however is a much more "virtual" view of Alibaba than I had previously held. Amazon wins through logistical superiority. You would not want to compete with them. 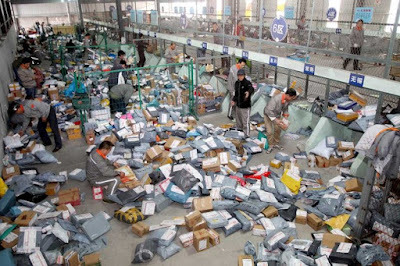 Alibaba it seems wins through logistical outsourcing of the highest quality. Now I asked "how many transactions per day do you think is 2.85 million in the peak minute"? We can do a comparison to Visa. Visa overbuilds capacity - they have built capacity to 56 thousand messages per second. We know from another press release that was about 4 times the actual peak in 2013. So the 2013 peak was 14,000 transactions per second - which is 840 thousand per minute. Visa's peak transaction volume globally is only about 30 percent of Alipay's peak minute. This suggests a level of shopping in China that puts the US, Europe and most of Asia to shame. So I asked: How would you test this. And I got some interesting answers - some of which might require a little work to pan out. However some answers wound up looking silly. If you think for instance that a substantial proportion of the transactions are low-value emoji then the remaining transactions wind up with implausibly high average value. But a few - knowing Bronte's history - suggested that we could not dismiss the idea that Alibaba was faking their numbers. Most people who suggested that knew what an extraordinary (and potentially outrageously profitable) suggestion it was. After all some two-bit reverse merger Chinese company might be a fraud - but you can only make a limited profit from that. The idea that Alibaba - a company with half the market cap of Google might be making its numbers up is - well - extraordinary. This was a tough question - and I did not expect many (if any) good answers. So I am going to leave it to you dear readers for comments. I am perfectly willing to accept answers which demonstrate that the "fake numbers" thesis is wrong. Indeed the thesis is extraordinary and hence likely to be wrong. There was a Wall Street Journal story recently about delivery infrastructure in the provinces. 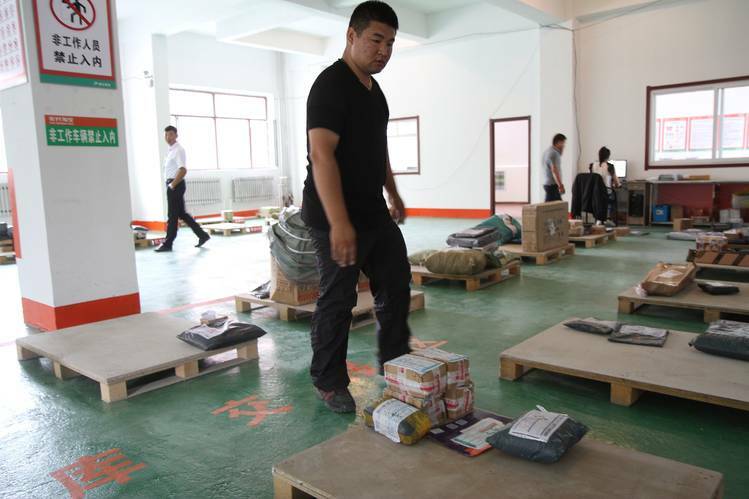 There was a picture of a delivery station in Northeastern China. It was - to put it mildly - crude. Alibaba's own promotion material contains several videos of their logistic operations. Here is a video interview of a woman describing the seasonal work packing boxes for Singles Day. Similarly there is b-roll material of packaging happening in one of Tabao's merchant shops. This involves distinctly low-tech (and slow) packaging and sorting for Singles Day. It is however clearly in part aimed at a Western audience (and presumably Western investors) as the whiteboard is in part in English. It is worth comparing this to videos of Amazon's warehouse and packing system. At this point I know the numbers are wonky - but working out whether this is material or not (or how material) will require some fine measurement techniques. The two best candidates both had good ideas on this - but again testability is going to be hard. I would accept ideas by email too.